Join Sierra Adventures for an unforgettable trip exploring the wet side of the Reno / Lake Tahoe world. 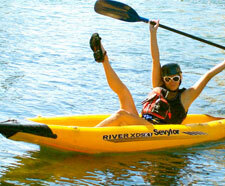 A Truckee River rafting adventure is fun and exciting for the whole family. We have tours & clinics for beginner to advanced, just ask for more information. Kayaking the Truckee River is a fun and exciting adventure the whole family can enjoy together. We have tours & clinics for beginner to advanced, just ask for more information. 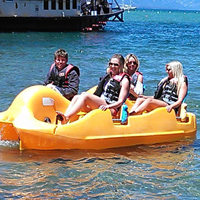 Tubing the Truckee River is a fun and exciting adventure the whole family can enjoy together. 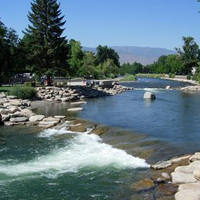 Experience the mighty Truckee and Reno's downtown whitewater park. Join Sierra Adventures to explore and savor the unparalleled beauty of the high sierra lake from the platform of a beautiful sailing yacht. Enjoy a slower mode of water transportation that gives you time to really enjoy the scenery. 2 - 4 person pedal boats available. This is a relaxing adventure, for you to enjoy the great outdoors while angling the pristine waters of the Truckee River or Lake Tahoe. The latest craze to hit the Tahoe area is a cross between kayaking and surfing. Paddle boarding is where you stand on an oversized surfboard and paddle across or around the lake. This adventure lets you see the Lake from out on the water, then gives you the opportunity to bask in the crisp, clean High Sierra sunshine. Fun for the whole family. Jetskiing is a thrilling way to have a blast and see the Lake in a unique way.